Ideal for economical low-volume, high-quality sheet metal forming, the Avure model QFC 0.7×1.8-800 Flexform™ fluid cell press features rectangular trays measuring 27.5” x 72” (700 x 1850 mm). The press will be used primarily for the forming and production of structural and reinforcement sheet-metal components for Robinson’s popular series of helicopters. 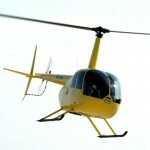 It will also be used for rapid parts prototyping in new helicopter model development. “The new high-pressure press is well suited to meet today’s imperative for less and less labor involvement, enabling the U.S.-based Robinson to meet the competition from lower-wage countries,” comments Tres Frank, Avure’s Business Development Manager, Americas. Established in 1973, Robinson Helicopter has been growing in tandem with the expanding market for affordable, reliable helicopters. The versatile aircraft are deployed in applications as diverse as law enforcement, pipeline patrol, flight training, and live television broadcasting. The company’s 617,000-square-foot factory, staffed by a workforce of 1,200, is equipped with the latest machinery, including CNC (computer numerically controlled) machining centers and CMM (coordinate measuring machines). “We trust the high-pressure equipment from Avure will suit our needs very well. We also look forward to a long-term partnership with Avure in order to address additional fabrication steps as required, such as the optimization of the design of our forming tools,” Mr. Walden concludes. An innovator with a strong record of accomplishment, Avure Technologies (formerly known as ASEA, ABB, and Flow), demonstrates its expertise in high pressure by occupying leadership positions in industrial and food applications. The company is the largest global provider of ultra-high pressure systems utilized to form sheet metal, to process advanced materials, and to pasteurize foods without heat or chemicals. Avure has installed over 1,700 high-pressure systems worldwide, more than all other competitors combined. These systems are characterized by technically sound design, superior reliability, energy efficiency, low maintenance costs, and many years of experience. Many Avure presses have been in service for more than 40 years, and some have surpassed 1 million high-pressure processing cycles. Avure Industrial Group headquarters in Västerås, Sweden, house equipment design, manufacturing, and support operations, with additional facilities in Columbus, Ohio, USA, and regional sales and support operations globally. Located in Torrance, California, Robinson Helicopter Co. has grown to become the world’s leading manufacturer of civil helicopters since its founding in 1973. The company, which delivered its 11,000th helicopter in 2013, employs a workforce of 1,200 in 617,000 square feet of manufacturing space at the Torrance Airport. It also offers a factory overhaul program for older aircraft and conducts monthly safety courses for helicopter flight instructors and maintenance technicians. A network of more than 400 service centers provides world-wide service and support. Pioneering founder Frank Robinson is a 2013 recipient of the Daniel Guggenheim medal for outstanding achievements in aeronautics.